Low body weight, also known as failure to thrive in children age 2 or under, can lead to serious repercussions for your toddler. According to experts at Lucile Packard Children's Hospital at Stanford, small children who do not gain appropriate weight or grow sufficiently can suffer from irritability, fatigue and delayed development. Researchers at the Nutrition Foundation of India, New Delhi, found that preschoolers who don't receive adequate nutrition are at risk for depression and infections. A healthy, balanced diet is important for underweight toddlers. Incorporating particular foods into your toddler's diet may benefit the weight-gaining process. 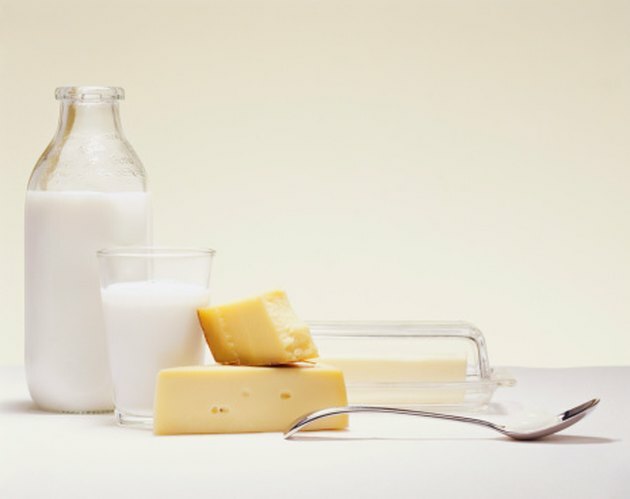 Milk and cheese are dense in calories and fat and can serve as bulking agents in foods for toddlers. They also provide nutrients, such as vitamin D and calcium, that are important to infant growth and wellness. Add shredded or cream cheese to toast and sliced cheese to crackers and sandwiches. Use whole or 2-percent milk rather than water in hot cereal, mashed potatoes, soups and hot chocolate. 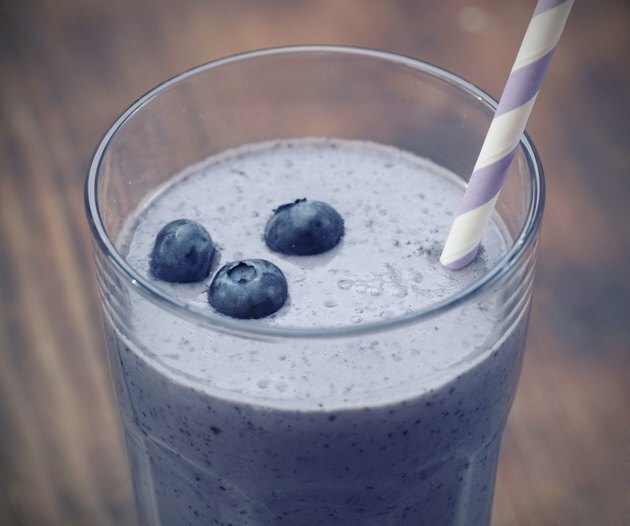 Consider milk or yogurt-based smoothies as a valuable and versatile option for your toddler. Add a variety fruits and even vegetables for best nutritional benefits. 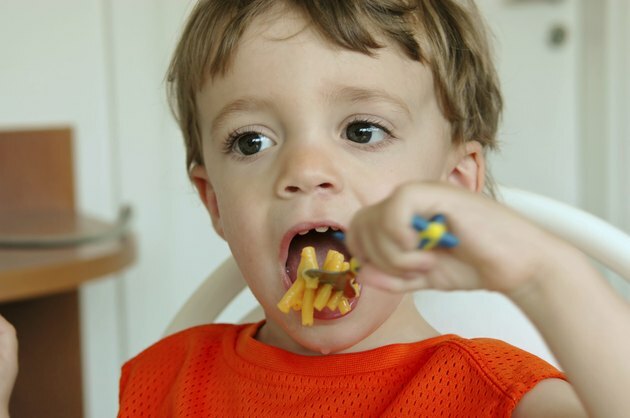 According to pediatric dietitian Jacqui Lowden from the Manchester Children’s Hospital, small children should consume a starchy food, such as pasta, rice, bread or potatoes, at each meal. Whole grains, though ideal for adults, may contain too much fiber for toddlers and fill them up quickly. Choose enriched, starchy carbohydrates that provide energy without excessive satiation. Macaroni and cheese is a positive meal choice, because it provides starchy carbohydrates as well as fat and calcium. Pasta topped with tomato sauce provides starchy carbohydrates as well as various vitamins and minerals, such as lycopene and vitamin C. Keep in mind that whole-grain breads and cereals can be added gradually as the child develops and once proper weight has been attained. Small children require more fat and dense calories than adults, particularly if they are underweight. Foods dense in healthy fat, such as avocados, are nutrient-rich and include a dense amount of calories. 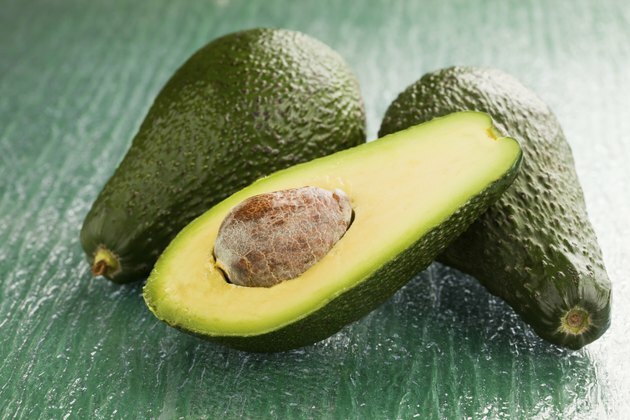 Mash avocados and add them to smoothies, soups, dips, sauces and spreads. Consider avocado puree as a butter-substitute in sweet foods, such as brownies, for a more nutritious option. Avocados will affect the texture and flavor slightly, but the result is a sweet treat that offers positive nutrition. Nut butters, such as peanut or almond butter, are a positive source of unsaturated fat as well as modest amounts of protein and fiber. Add nut butter to crackers, bread, cookies or smoothies for added calories and nutrients. Though nuts contain healthy fats as well, they are less ideal, because they are small and could potentially obstruct a toddler's airway or cause choking. 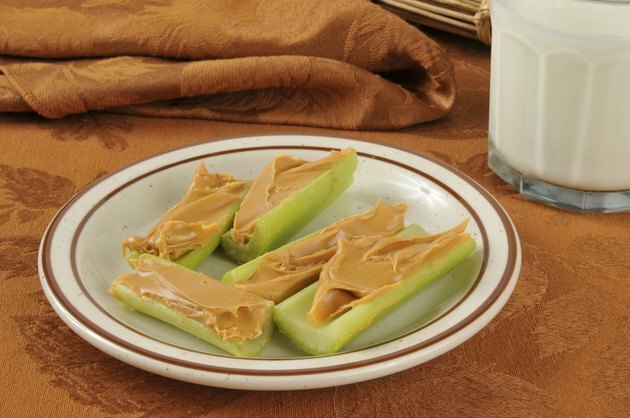 To add enjoyment to the eating process, invite your toddler to help you make "ants on a log" (celery sticks topped with peanut butter and raisins) or cut his or her peanut butter sandwich into a fun shape, such as a heart or sunshine. If your child seems "picky," requesting crust-less sandwiches and the like, know that it is likely important to your toddler now and do what you can to meet their request. More than likely they will outgrow such preferences.